These buttons, specifically used for display and for navigation on the project surface, are found in the Navigator window. It is accessible in the Windows > Show menu. 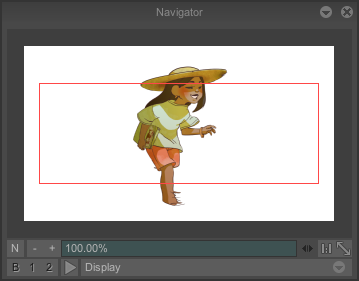 This panel also allows you to have a low quality preview of your sequence/animation which can be useful by pressing the button. - The red rectangle indicates the current display area in your window relative to the full image. By click and dragging in this zone, you can move your workspace. - Button N is used to open a new project window. - – and + buttons, the numeric field and the minislider let you zoom in and zoom out. - The Reset zoom to 100% ( ) and Auto fit ( ) are the same as those in the project's window. - B, 1 and 2 are active with fielded projects as we saw earlier. - The Display popup menu is the same as described previously and as described in lesson 02.